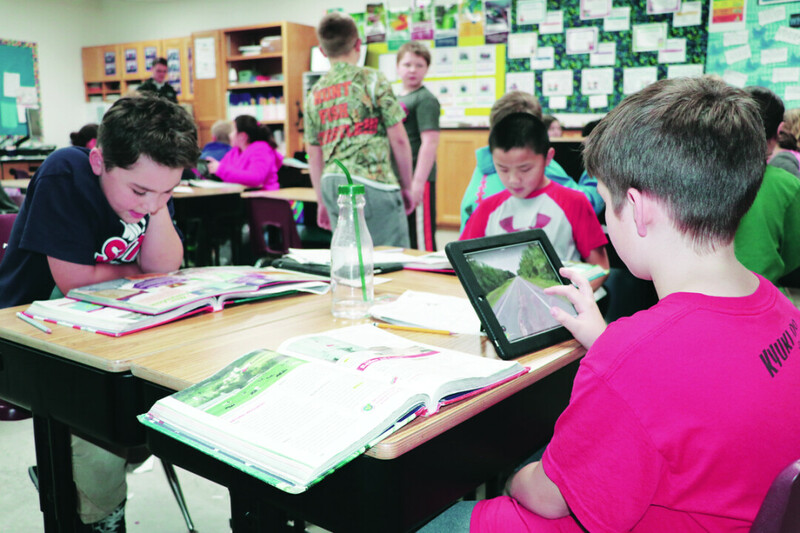 Beth Duellman works with her fourth-grade students in a project-based learning environment at Sam Davey School in Eau Claire. 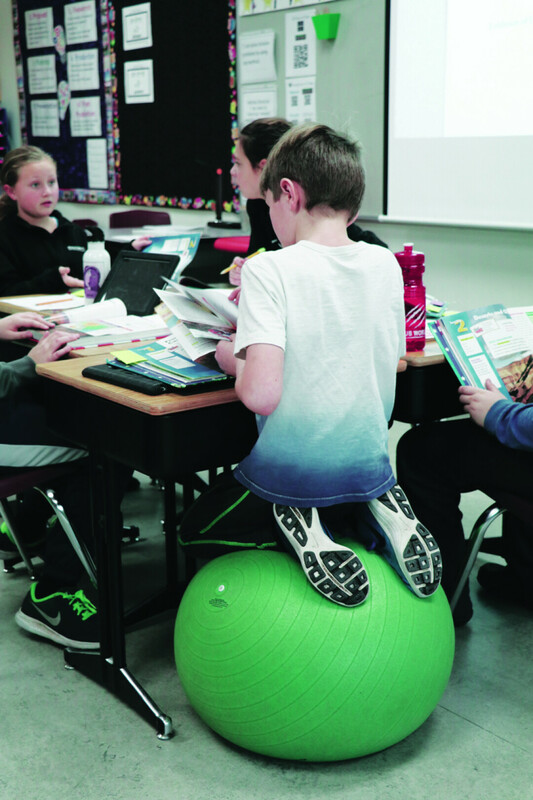 Beth Duellman’s fourth-grade class at Sam Davey Elementary School is deep into its second trimester researching the theme, “How does geography affect industry in a particular region?” Four desks are pushed together for a think-tank among the respective occupants. The tools at hand include pencils, spiral-bound notebooks, geography textbooks, and iPads. If you look around the room, many of those iPads display Google Earth as students scan the topography of a given area. There is a low hum in the class as they communicate ideas, asking question after question of each other and the iPads they’ve been armed with. This is project-based learning. In the words of the Buck Institute for Education – a nonprofit organization that promotes this educational approach – project-based learning “is a teaching method in which students gain knowledge and skills by working for an extended period of time to investigate and respond to an authentic, engaging, and complex question, problem, or challenge.” To put it another way, project-based learning – sometimes also known as PBL – is an approach to learning that provokes students to think creatively and collaborate, with an end goal of gleaning all they can about a given topic or passion. Rather than the traditional delivery of facts on a topic by the teacher and notes being taken by the student, project-based learning is student-led. Students uses the tools at their disposal – books, technology, community – to research a topic. Through hands-on work, they create a presentation on all that they are able to understand about that topic, with their approach encompassing many traditional classroom subjects such as math, science, and literature. This approach is supported by a spacious schedule: There’s less emphasis on fitting work into the length of a specific class. The environment is also non-standard, often with comfortable chairs or independent work tables that support research and reporting. It can often resemble the study lounge of a college dorm, an analogy apparent in the disciplined, independent work of the students. Sam Davey Elementary Principal William Giese finds the PBL approach complements the STEM (Science, Technology, Engineering, and Math) curriculum offered at the school. “By allowing students the opportunity to learn in a project-based learning approach, the student becomes more active in their own learning,” he said. “Children spend time reflecting on themselves as learners. They better understand their own learning needs, and then, with the support and guidance of the teacher, can leverage their personal strengths into the project they have designed. “Students are allowed to set goals, self-monitor, and ultimately demonstrate their learning in powerful ways,” he continued. “We have witnessed an increase in student engagement when using this approach to learning.” The goal for next year is to have approximately 140 fourth- and fifth-graders partaking in the PBL approach. “Hands-on learning experiences are more fun because we are making something,” Hannah Johnson, one of Duellman’s students, reported excitedly. “We have to learn how to communicate and work well with others. We have to cooperate and work together as a team to problem solve. It makes us think more and solve real-life problems.” Examples of the hands-on learning experiences offered are engineering challenges including the Global Cardboard Challenge, a school-wide “Hour of Code,” virtual field trips (including one with a scientist in Antarctica with penguins circling her feet! ), Mystery Skypes with classes from all over the world, and using numerous apps to demonstrate creativity in learning. Duellman would like to see PBL infused into the school day elsewhere as well. “Hopefully all schools will be able to implement STEM education utilizing a PBL structure for at least part of the school day,” she said. A NATURE SCHOOL AT LITTLE RED?